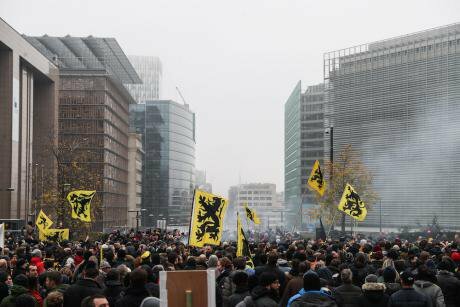 Right-wing and far-right protesters attend the "March Against Marrakech" rally in front of EU headquarters in Brussels, Belgium, Dec. 16, 2018. Zheng Huansong/ Press Association. All rights reserved. As its title might suggest, the Global Compact for Safe, Orderly and Regular Migration was not supposed to be controversial. It is the first international framework to help countries achieve mutual goals on international migration, like combatting human trafficking or making sure that all migrants have adequate identity documents. It is impossible for any country to accomplish these tasks alone, making the establishment of an international cooperation framework all the more urgent. But despite its nonprovocative (and non-binding) nature, the compact has become a target of far-right politicians in Europe who have stirred up a flurry of political shuffling and gamesmanship leading up to the meeting on 10 and 11 December in Marrakesh, where UN member states approved the final draft of the compact. A domino effect of EU countries backing out of the compact began in Austria, with Chancellor Sebastian Kurz arguing that the compact mixes up labour migrants with those seeking international protection, although the compact specifically states that ‘migrants and refugees are distinct groups governed by separate legal frameworks’ and that the compact only addresses migrants. Austria takes a hard line approach on migration, so the decision wasn’t a total surprise. But as the current holder of the rotating presidency of the Council of the European Union, Austria is still expected to serve as mediator for EU member states on difficult topics. To reject an international cooperation framework that took 18 months to negotiate and draft, especially at a time when migration is a divisive topic in European politics, hardly fits the bill. The decision appears to have emboldened far-right politicians elsewhere in Europe to call for rejection of the compact. Poland, Bulgaria, Czech Republic, Slovakia, and Latvia all followed Austria’s lead. The Italian government also did not attend the meeting in Marrakesh, stating that the decision on signing must be made by parliament. It was unlikely, however, that the Italian parliament would approve the document, considering its recent decision to jeopardize the legal status of an estimated 130,000 people who currently have humanitarian protection. In Belgium and the Netherlands, governments coming under pressure from the far right found it necessary to put forth an explanatory declaration hedging against the supposed unintended consequences of the compact, though it is hard to imagine what consequences might arise from a document that, by design, has no teeth. While it is not surprising that far-right politicians would reflexively oppose a consensus document coming out of a UN process, their increasing power in European politics has also pushed mainstream conservative parties further to the right on migration. In Belgium, which has regional, federal, and European elections in 2019, the center-right coalition government fell apart the day before the Marrakesh meeting, after one of the coalition parties, N-VA (New Flemish Alliance), refused to support the compact. It is not unlikely that N-VA, a Flemish nationalist party, made the move as a gesture to right-wing voters for the upcoming elections, as they are under pressure from the extreme-right party Vlaams Belang. And it is worth noting that next year Poland and Slovakia, which have both refused to sign the compact, will have parliamentary and presidential elections, respectively, in addition to the EU parliament elections in all member states. The political turmoil around the Global Compact should serve as a warning that nationalist politics are not fading. The prospect of far-right parties making significant gains in the upcoming EU parliament elections throws in doubt the EU’s ability to tackle difficult issues like reform of the Dublin regulation, which sets rules on which EU country has responsibility for handing asylum claims. But the way in which far-right politicians were able to take advantage of the Global Compact as a tool for political posturing can also be instructive. The public heard little about the compact (and even less about the separate Global Compact on Refugees) during the negotiation and drafting stage. Thus, far-right politicians were able to say anything they wanted when the final draft was revealed. This left supporters of the compact on the defensive and forced debate to revolve around whether the compact was legally binding or infringed on national sovereignty. And despite all the current attention on European politics, one of the document’s main priorities is to ‘minimize the adverse drivers and structural factors that compel people to leave their country of origin’. In this respect, the Global Compact can be seen as an extension of the 2030 Agenda for Sustainable Development, and the two documents reinforce each other. The European debate has thus far failed to take advantage of a larger narrative about sustainable development and helping people worldwide adapt to a changing climate and natural disasters. Finally, the European debate on the Global Compact seems to ignore entirely the fact, as pointed out in a recent paper by the Centre for European Policy Studies, that EU citizens become migrants whenever they are outside the EU. European countries that reject the compact are thus turning their backs on their own citizens who travel or live outside the EU. The Global Compact for Migration is also for Europeans. The Global Compact furthermore reinforces the existing work of EU countries as part of the overall project of intra-EU mobility, like efforts to better recognize skills and diplomas obtained in other countries. Almost 4% of EU citizens of working age live in a member state other than that of their citizenship. The percentages are significantly higher among citizens of Bulgaria, Poland, Latvia, and Slovakia, which have rejected the compact. But movement within the EU is still not frictionless, and over-qualification for their jobs can still be a problem for EU citizens who have moved to other member states. In that context, the compact’s objectives on inclusion and labour market integration could provide another impetus to improve implementation of the rights and benefits of EU citizens. Thus, by getting sucked into a debate with parameters set by far-right politicians, supporters of the compact have missed a critical opportunity to highlight that migration is not just something that happens to Europe, but that Europeans are themselves highly mobile and actively benefiting from migration. The Global Compact for Migration is also for Europeans. This was first published on Migrations News Sheet on December 11, 2018.